6 December 2017–A decade after beginning work on an earthquake early warning system, scientists and engineers are fine-tuning a U.S. West Coast prototype that could be in limited public use in 2018. 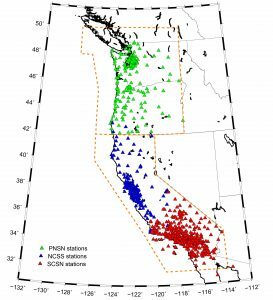 In two papers published December 6 in Seismological Research Letters, researchers describe the key components and testing platform for the prototype ShakeAlert system, now being tested in California, Oregon and Washington. The development of ShakeAlert has shown that a dense network of seismic stations, swift transfer of seismic data to a central processing and alert station, speedy paths for distributing alert information to users, and education and training on how to use the alerts are all necessary for a robust early warning system, said Monica Kohler, a Caltech research faculty member in the Department of Mechanical and Civil Engineering. ShakeAlert was developed using seismic data collected by the Advanced National Seismic System (ANSS), a national collection of seismic networks supported by the U.S. Geological Survey. About 760 seismic stations now contribute to ShakeAlert. One of the “top of the list” priorities for improving West Coast early warning, said Kohler, would be the addition of almost 1000 more stations in these networks. To remedy some of this shortfall, the ShakeAlert system is testing the use of “volunteer” accelerometers, mostly in the Los Angeles area, that are sensitive enough to detect earthquakes and can be plugged in at a business or home, bypassing the more expensive permitting and installation needed for a full-scale seismic station. ShakeAlert’s algorithms now estimate a “point source” for an earthquake, but “we are working on the ability to incorporate algorithms that can handle very large earthquakes that happen in a way that can’t be approximated to a single point,” Kohler said. The current version of the system, she said, is less successful in providing useful warnings about earthquakes that rupture a long section of a fault and evolve over time, such as the M9.1 2011 Tohoku earthquake in Japan. When ShakeAlert expanded from California to include Washington and Oregon in April 2017, the developers also created a single set of algorithms that could be used in the Pacific Northwest and Northern and Southern California. The challenge, said Kohler, was to develop a standard set of algorithms that could account for the different tectonic environments in each region, including the offshore subduction zone in the Pacific Northwest and the mostly on-shore faults in California. From the start, ShakeAlert has had a steady group of beta users—ranging from government agencies to businesses—who have helped the team with valuable feedback for the system. For instance, the ShakeAlert team is learning more from its beta users about how much uncertainty the users will tolerate in the alerts and how fast versus how accurate they want those alerts to be. ShakeAlert works with third-party companies to decide how to disseminate the alerts, what form the alerts should take, and what kind of information is in the alerts–and there isn’t a one-size-fits-all approach, Kohler noted. For instance, a school may have higher tolerance for false alarms—students will lose a few minutes of instruction by ducking under their desks—but a railroad or a machinery assembly line may want to shut down operations only for the most high-certainty alerts. As ShakeAlert moves toward wider public use, Kohler and her colleagues hope their SRL papers will serve as a good reminder of all the elements necessary for earthquake early warning systems. “Sometimes there is a misperception that all you need is a good algorithm, or all you need is a small array of seismometers in your region of interest, but either one of those or even both of them isn’t going to get you very far in terms of producing a robust system over a large seismically active area,” Kohler said.